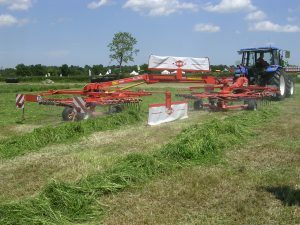 It is presently enriched as a component of the European thematic network ‘Inno4Grass‘, coordinated by Arno Krause, Gruenland Zentrum. The aims of this thematic network is to describe innovative practices implemented by farmers for a better use of the temporary and permanent grasslands, to consolidate them with knowledge from science and to disseminate them throughout Europe. Why a Focus on Grasslands? Grasslands are an essential step in the process of feeding livestock, and thus eventually the supply of milk and meat for human populations. This link positioned at the beginning of the food chain is directly related to our own food and it holds a decisive position. A demand for these basic products (meat and milk) is increasingly important, especially coming from emerging countries. The objective is to meet this increasing demand while taking into account the social dimension (ensuring economic sustainability for the farmers) and environmental dimension (in order to reduce the environmental cost, or negate it) related to this chain while facing international competition.